Where It's Found in Utah: Kane and Garfield counties, Grand Staircase-Escalante National Monument, southern Utah. Description: With a grand total of 15 horns and spikes on its head, this dinosaur has been nicknamed “the horny-est dinosaur ever.” It has ten horns and spikes on its frill, two horns above each eye, one horn on the tip of its nose, and one horn coming out of each cheek! The name Kosmoceratops richardsoni, means ornamented horned face (kosmos, Greek for ‘ornamented’ and ceratops, Greek for ‘horned face’). You might think Kosmoceratops used their elaborate horns and frills for defense, but paleontologists think it is more likely that they used them to try to attract mates, much like a male peacock tries to impress a female hen with its multi-colored display feathers. This impressive animal was about 15 feet (4.5 meters) long from the tip of its nose horn to the tip of its tail. The skull by itself is just under 6 feet (2 meters) long! As you might have guessed from its name, Kosmoceratops is a relative of the famous Triceratops. Why It’s a Top NHMU Dinosaur: Kosmoceratops richardsoni is one of several new species of dinosaur discovered by Natural History Museum of Utah paleontologists in the Grand Staircase Escalante National Monument. NMHU/BLM volunteer Scott Richardson discovered the first fossil in the summer of 2006. NMHU volunteers spent hundreds of hours preparing the fossils in the Museum’s fossil prep lab. Now both of the only two known Kosmoceratops specimens are housed at NHMU! 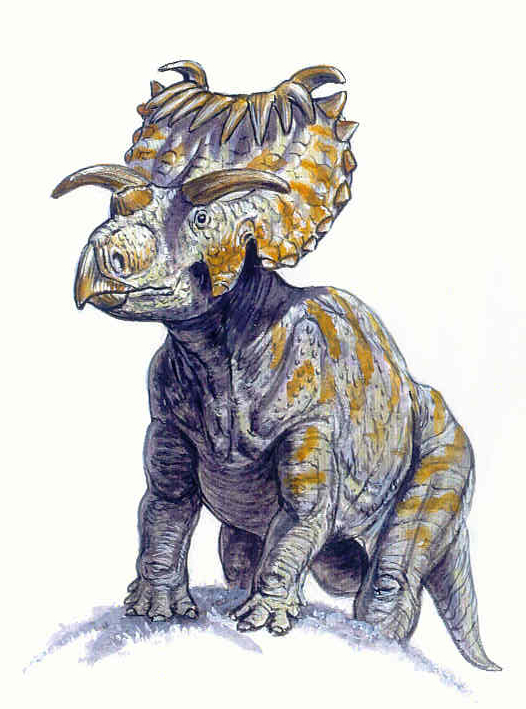 Kosmoceratops is most closely related to a ceratopsian species from Alberta, Canada, named Vegaceratops irvinensis. This relationship suggests that horned dinosaurs moved back and forth across western North America during their evolutionary history and may support the theory of alternating periods of isolation and exchange between the north and south part of the continent during the Cretaceous Period. Where Can I See It? : The Past Worlds Gallery at the Natural History Museum of Utah. Getty, M. A., M. A. Loewen, E. Roberts, A. L. Titus, and S. D. Sampson. 2010. Taphonomy of horned dinosaurs (Ornithischia: Ceratopsidae) from the late Campanian Kaiparowits Formation, Grand Staircase-Escalante National Monument, Utah; pp. 478-494 in M. J. Ryan, B. J. Chinnery-Allgeier, and D. A. Eberth (eds. ), New Perspectives on Horned Dinosaurs: The Royal Tyrrell Museum Ceratopsian Symposium. Indiana University Press, Bloomington. Sampson, S. D., M. A. Loewen, A. A. Farke, E. M. Roberts, C. A. Forster, J. A. Smith, and A. L. Titus. 2010. New horned dinosaurs from Utah provide evidence for intracontinental dinosaur endemism. PLoS One 5:e12292, 1-12.